I’ve added a few new links to our network. I hope you will take a look and consider being part of the family. You will find them in the sidebar on the right. This link takes our readers directly to the Blogging 101: From Zero to Hero online course. This is a free course sponsored by The Daily Post, a community of WordPress users and moderated by WordPress editors. While it is too late to register for the course, you can follow along with course assignments. You just won’t be involved in the community discussions. The Daily Post also sponsors other courses and blogging prompts that will help you become a better blogger. Which ever category defines you, click here to contact us. Additionally, you can sign up for their newsletter. Each newsletter provides a sample of the helpful information you will find on our website. Each newsletter will be packed with featured articles, tips and information to make your RV experiences a little better. Some of the other items we will be bringing you will be: our featured RV website, our featured RV blog, product reviews, campfire cooking, RV news and other RV related events. Feedly is the news aggregate I wrote about in a previous blog. If you read several blogs, Feedly is for you. Read your blog or news feeds in one simple location. Whether you read blogs on your PC, tablet or smart phone, Feedly has an app for that. That’s a lot of new things for Tales From The WagginMaster. I certainly hope you enjoy these additions. And I hope you visit them to see if there is something there you may enjoy. I think I’ll rest now. Thanks for stopping by, y’all come back now. Have you ever made a New Year’s Resolution that you kept? I have. Problem is I cannot remember when it was. But I do remember what it was? I resolved to no longer make New Year’s Resolutions. Like, said, I cannot remember what year that was made. I guess that implies it was a long time ago. Having said that, now why would I make such a resolution? There was a period of time when I had trouble keeping such commitments. I am sure I never really thought about what it meant to keep resolutions. So it only made sense to stop making them. Now, this is interesting that this would be the topic for today. The other day, I saw the following clip on a friends Facebook post. Normally, I glance at these type of Facebook postings and move on. Occasionally, I will make a comment on the post. Rarely will I share the post. As I read through these 7 simple yet profound statements, I thought about the timeliness of my friend posting this. Then it struck me like a 2×4 on the forehead – these are my 2015 resolutions. Now that presents a dilemma. If I adopt these statements as my New Year’s resolutions, then my last kept resolution becomes a broken resolution. OK, so how do I get past this dilemma? 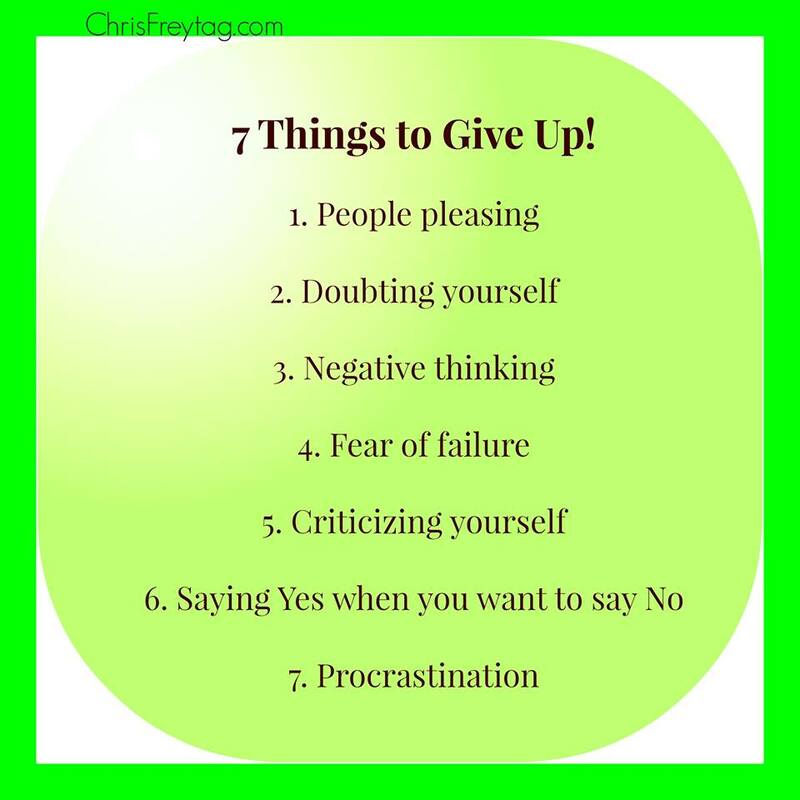 My solution is to not call this list of 7 things to give up my New Year’s resolutions. I still want to adopt them as my modus operandi for 2015. So what do I call these? Maybe I should take the authors hint and call them 7 things to give up in 2015. That’s what I’ll do. These are my 7 things I will give up in 2015. Do you make New Year’s Resolutions? More importantly, do you keep the resolutions you make? If you don’t why bother? If you do, good for you. By the way, I did share this post on my Facebook timeline. Where were you last night when 2014 turned into 2015? Is that where you wanted to be? These are questions that came from last years writing challenge from the Daily Post. If you are interested in these prompts, an eBook is available here (365 Writing Prompts). The first question is the easiest, I was snuggled under our warm electric blanket. Not sure what I may have been dreaming about. I do dream but I rarely remember them. The second question is more or less a moot point. Cannot change the past so why dwell on what could have been. To go along with the question, it would have been nice to be in a tropical location, sitting around a campfire with friends reminiscing about the year that has just closed. Or, it would have been nice to spend that time with family. Actually, I am perfectly content with where we are. It has been a long time since we have gone out on New Year’s Eve. We’ve done that in the past and see no point in doing that now. 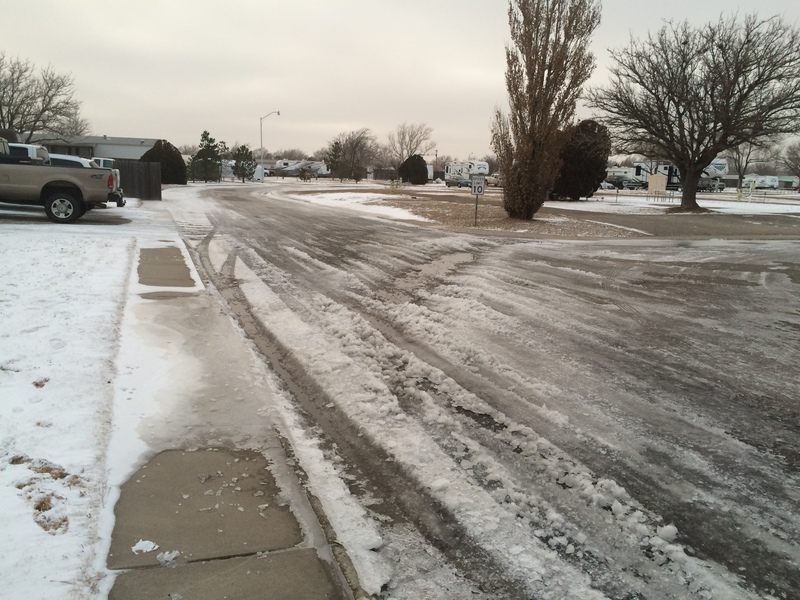 In Amarillo, snow and ice has made traveling on the roads dangerous. It just made sense for us to stay in and go to bed at our regular time. A few days ago, I wrote about my interest in writing (or blogging) more frequently. You can read about that here. I signed up for The Daily Post’s Blogging 101: Zero to Hero course. That does not start until Monday, Jan 5th so I though I would get a jump start on my goal of blogging more. Somewhere about 8PM on Monday, 12/29, I bid farewell to my friend ’32 degrees’. That is about the time the temperature dropped below 32 degrees. We were in for a few days of cold weather. Sure enough, on Tuesday, we started the day at 12 degrees – and it did not get much warmer. We lost water by 10AM due to the freezing temperatures so I went to the office to get their heavy duty heat gun. Our heated water hose was doing just fine. The water pressure regulator apparently was frozen. I gently applied heat to the brass housing of the regulator to get the water flowing again. Then I got my trusty mechanics trouble light and stuck it into the wet bay. I just knew the 75 watt bulb would keep things nice and toasty down there. Yep, we had good water flowing all day. New Years Eve, we woke up with frigid temperatures – 3 degrees to be exact. And it was not going to get much better at all. Guess what? That’s right, the 75 watt incandescent light bulb had not produced enough heat to keep the wet bay warm. Once again, I use the industrial heat gun from the office to attempt getting our water flowing. That did not work as it did Tuesday. I’m now thinking our heated water hose failed or worse, the water line coming into our water box on the ground had frozen. After turning off the water at the faucet, I disconnected the hose. Turned the water back on and had water flow. OK. Water is getting to our heated hose. I disconnect our water hose from the wet bay, turned the water back on at the faucet. YAY! I have water flow. Our heated hose is doing just what it promised to do. By now, was wet and cold. The wet spots on my jeans had already turned to ice. Dang it was cold. 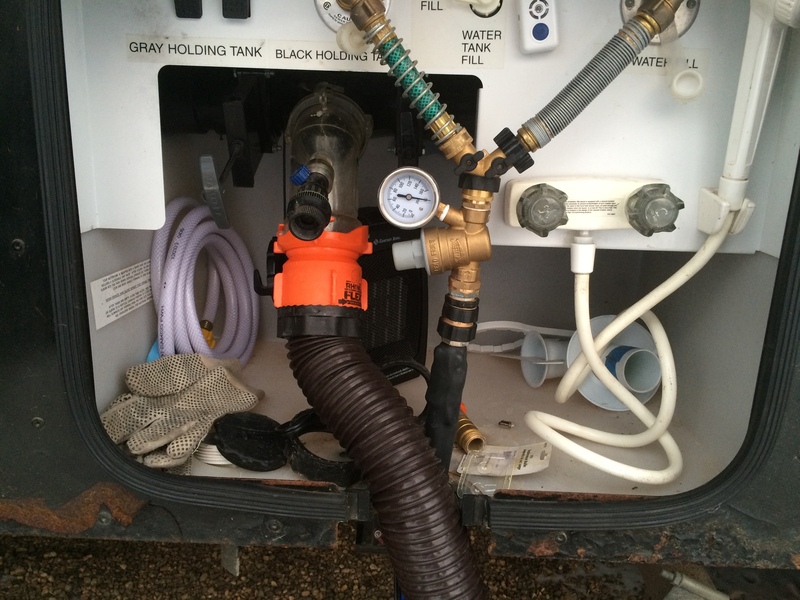 I pulled apart the plumbing at the wet bay, connected our hose to a backup water pressure regulator and connect that to the water inlet in the wet bay. Carol verified we had water flowing in the RV. Good. Time for me to come in a get warm. I brought our fancy water pressure regulator in so I could take a closer look at it. The ice in the water pressure regulator was colder than ice. Sorry, I did not get a photo, but it was full of ice. Now I need to figure a way to get more heat into the wet bay. I did not want the RV’s water lines down there to freeze up. We have a vent under the shower in the bathroom that allows the air temperature from inside the RV to flow into the wet bay. But guess what? Heat rises. I placed a small fan in front of the vent under the shower and turned it on hoping I could force warm air into the wet bay. I moved our outdoor remote temperature sensor to the wet bay so I could monitor the temperature down there. Sure enough, the temperature in the wet bay was rising. Time to make a trip to Walmart and hopefully find a small electric heater that I can place in the wet bay. There she is. At $18.84, the price is right. I am sure this will do the trick. When we got back from Walmart, I placed this down in the wet bay, set the temperature about mid point, turned it on high, and closed the bay door. By the time I got back in the RV, I could watch the temperature rising. When the temperature zoomed past 95 degrees, I decided I should turn it down a bit. 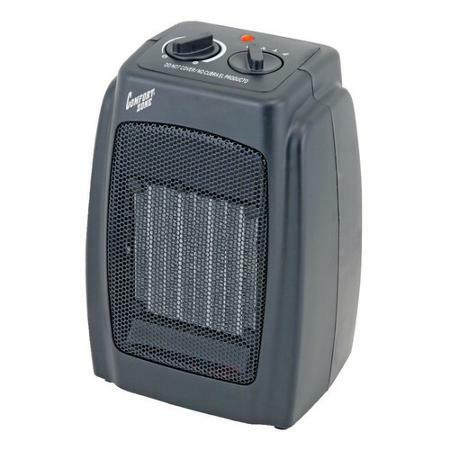 By the time I went to bed, I was satisfied that the little heater was doing just fine. When Carol came to bed she told me the temperature reading was approaching 95 degrees. Sheesh! I was nestled under the covers working a Sudoku puzzle on my phone. I got up, got dressed, went outside and turned it down a little more. I awoke around 2AM from a sound sleep. Better go check the temperature in the wet bay. Super. We have it under control. Temperature in the wet bay was a comfy 54 while outside it was in the low teens again. I believe we will have water when we get up later. Sure enough, we got through another cold night and did not freeze the water pressure regulator. This afternoon, I headed back to the wet bay to replace the plumbing previously removed so I could get our black tank dumped and rinsed. Temperature was now in the high 20’s so at least it was more comfortable after working on this with frigid temperatures. Pay no attention to gauge reading. I need a new gauge on the regulator. It was apparently thrown out of calibration by the ice that was there. Behind the sewer line and the water pressure regulator, you can see the little heater that will keep the wet bay from freezing. The wet bay is basically a plastic box. Perhaps if I insulated the box, it would do better. That is a job for a warmer day. Or maybe I should select a warmer spot for our winter workamping gig. This is what the street in front of our site looks like. The patch on the sidewalk is slick. The weather is warming up over the next couple of days. That is the good news. However we are expecting a wintery mix of rain, sleet and snow through the weekend. YUCK! So, where were you at the stoke of midnight? Thanks for stopping by, y’all come back now. With the arrival of a new year, I am embarking on a new plan for our blog. When I started this blog, the intent was to keep family in the loop regarding where we are and what we are doing. Our first year of RVing, we spent a good chink of time sightseeing so it was natural to have a variety of topics about which to write. Then we settle down a bit and started RVing for $$$. This means we have less time for looking around. Blog content can quickly turn into mush when the topics include how I repaired the hole in the roof or 10 ways to rake leaves. Consequently, I slowed down from daily posting to weekly, then barely monthly. I read several blogs of friends who live full-time in their RV. For those who live in what I call ‘vacation’ mode, there is always something to write about. Vacation mode means moving around – not spending extended time in one place. I’ve noticed that some of my fellow bloggers have struggled to keep their blog as active as they once did. Many have re-energized their efforts while some have just stopped writing completely. My new plan for 2015 is to increase my blog writing. While we may not travel more in 2015 and while we may not see more sights or doing more exciting things, there are plenty of topics that can be explored. I stumbled on a couple of blog sites that I found interesting and motivational. One is The Daily Post and the other is Positive Writer – or more specifically Bryan Hutchinson’s article – The Very Best Articles on Writing for 2014 (on Positive Writer). I found The Daily Post through fellow blogger and RVer Ingrid on her blog Live Laugh RV. I always enjoy reading about their adventures and took a special interest when she and Al were in Galveston. Her post about their time in Galveston (click here) took me back many years to my youth and the time I spent in Galveston. More importantly, she pointed me to The Daily Post. I stumbled on Positive Writer through a FaceBook posting from my friend Alene Snodgrass. She is a Christian writer, speaker, and friend. Her blog, Positively Alene, is uniquely inspirational. Blogging 101 is four weeks of daily bite-size blogging assignments that take you from “Blog?” to “Blog!” At the end of the course, you’ll have a blog you’re proud and excited to publish — and that others are excited to read. So there you have it. A new year and a new plan about blogging. Perhaps you want to use these links or perhaps you just want to follow along to see how I do. Whichever the case, thanks for stopping by – y’all come back now.